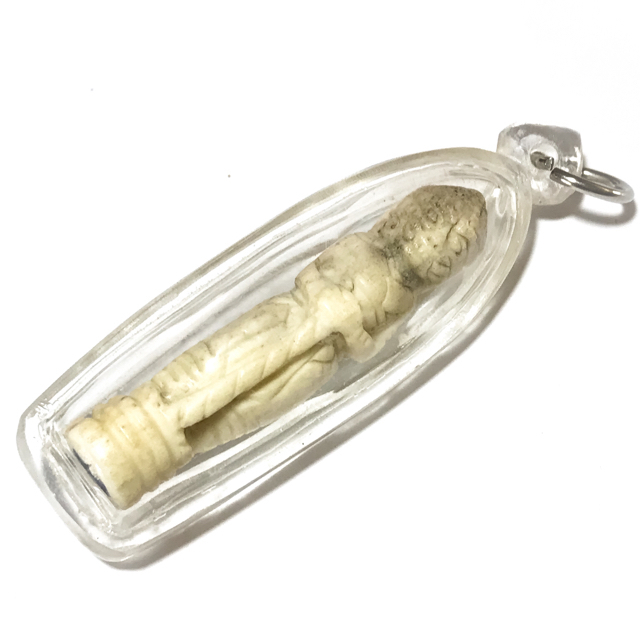 An extremely rare example of an early era Taw Waes Suwan Asura Deva Graduk Chang Gae - carved elephant bone amulet from Olden Days Sak Yant Thai Temple Tattoos Master, Luang Por Lae, of Wat Khao Song, in Petchburi. The statuette measures 6 Cm High, and is carved from Elephant bone, into the form of Taw Waes Suwan, the Millionaire Asura King of the Jadtu Maha Rachiga Kingdom of the Celestial Heavens, who commands all the denizens of Yaksa and Demonic Beings and Monsters with his Adamantine Crystal Club, a Cosmic Weapon able to smite the Demons and Bhuutaa. Taw Waes Suwann is a powerful protector of wealth, and Business Advancement, and protects against Black Magic, Demons and Bacterial Illnesses. Taw waes Suwan should also be revered by businessmen and financiers, and anyone who wishes to increase his financial and material wealth. Also in times of hardship and poverty, one should revere Taw Waes Suwann, which will enable you to have enough money to pay your bills and the cost of living with without any difficulty. The Great Luang Por Plern of Wat Nong Mai Luang, Famous for Wicha Hwaen Pirod, and Kong Grapan Magic passed on his magical secrets to Luang Por Lae. Luang Por Tong Sukh, Wat Tanode Luang, who taught him to perform Wicha Sak Yant Kroo, which was the most powerful Yant in his particular Magical Dtamra, namely the Yant Hua Jai Pra Ram (Heart of Rama Yantra), which controls the powers of all other Yant which are tattooed thereafter on the devotee, including the Ling Lom Vanora, Hanuman, & Gold and Silver Hongsa Swans. Luang Por Chit of Wat Mahatat, taught him the adept levels of Wicha Horasart (Astrology and Fortune Telling), and it is said that Luang Por Lae attained the 6th sense in this Wicha, and was able to foresee future events. Luang Por Soke of Wat Pak Klong in Ban Laem taught Luang Por Lae the Wicha Pra Khan (Sceptre, Ritual Dagger and Wands Magic). 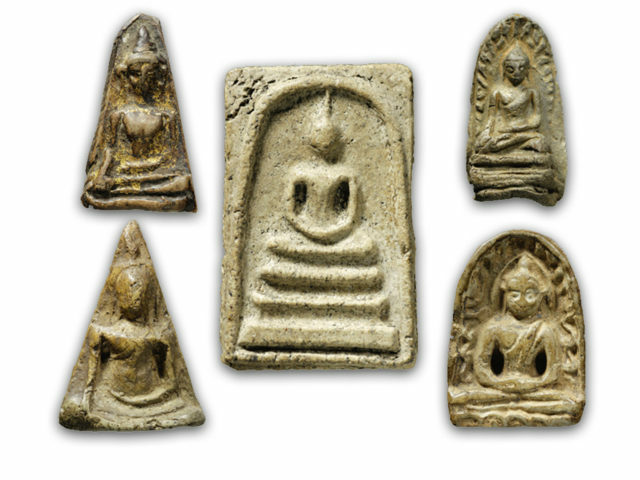 Luang Por Pan of Wat Mahatat Voravihanr taught Luang Por Lae the Wicha of Takrut Tone and Takrut Faed amulets. He was taught the Wicha Sak Yant Maha Maekh from Luang Por Dtor and Kun Por Jantr of Wat Khao Wang in Petchburi, and after their passing, for a long time, Luang Por Lae remained the only Monk able to perform this Wicha. In the year 2489, an event happened that caused Luang Por Lae to recieve a shock, as he was staying at Wat Maha Tat, where some terrible news about his family home had been broken into by marauders, who killed his mother and siblings (his father had already passed away beforehand). The only thing left in the home was a piece of gold weighing 100 Grams which the thieves had dropped as they fled the house, which Luang Por Lae had to use to cash in to pay for the funerals of his mother and siblings. Then he travelled back Eastwards, to learn the Wicha Palad Khik with his Kroo Ba Ajarn Luang Por Ee, of Wat Sattaheeb. Luang Por Lae then went back to Petchburi and used his Wicha to help the Local Devotees, and later became Abbot of Wat Pra Song. Luang Por Lae passed away in the Year 2551 BE on the 10th March, at the age of 92 years old. He is of course an especially revered master to those who are devotees of sak yant tattooing, and of those who have become enchanted with the many forsm of amulet he made during his lifetime, such as a large array of Hanuman amulets, Ganesha, Taw Waes Suwan, and Por Gae Lersi amulets which were made frm hand carved ivory. 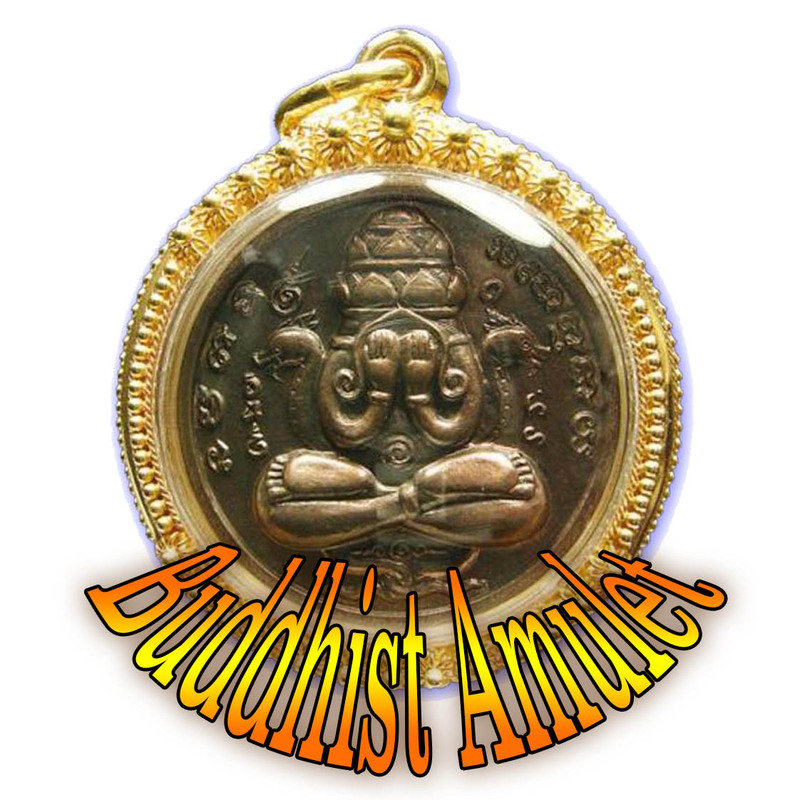 He has one of the more attractive pantheons of amuet designs within his magical trajectory, and many of his amulets are considered to be pieces of fine miniature Buddhist art in their own right. He is also a highly regarded historically famous master, due to the fact that he learned underr tutelage in Sorcery and Dhamma, from the incredible number of 14 other great Guru Master Ajarn, who bestowed him with their Wicha. The real name of the Kata is Aadtaanathiya Paritta - It is the Kata used for a Major Portion of the Suad Pan Yaks Thai Brahman/Buddhist/Occult ceremony to speak with the Asura Kings of the Jadtumaha Rachiga Realm, and request protection and auspicious blessings.